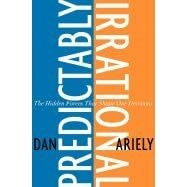 I've just finished reading Predictably Irrational by Dan Ariely. This is a great book that applies to everyone and should be required reading before you leave school. Everyone is guilty of being irrational in their decisions and some of us continue to do it everyday even though we know that it's stupid and, yes, irrational. One of the stories that I loved was the pen and the suit comparison. If you were buying a pen and saw it on sale for $30 and knew that you could buy it across town for $23 then you'd likely jump in your car, make the drive, and save yourself that $7. However, if you were buying a suit for $400 and the same applied you're highly unlikely to make the same trip to buy the suit for $393. Why would you do that. One of my favorite experiments that they did was that with Lindt Truffles and Hershey's Kisses. They priced the Truffles and Kisses at 15 and 1 cents respectfully and found that 73% of customers chose the Truffles. They were willing to pay that extra 14 cents to get a superior product. However, when the dropped the price by 1 cent and made the Kisses free then suddenly everything reversed and 69% of customers took the free Kiss over the Truffle even though the price differential of 14 cents was still there.